You have 15 minutes to evacuate your home due to a fire, flood, tornado, earthquake, chemical spill, transportation accident, disease outbreak, community disturbance, mass casualty or terrorism event. Are you prepared? Do you have a plan to protect your loved ones ― including your pets and other animals — from disaster? The burden of planning and preparation is on you, according to Catherine Vogelweid, a clinical professor in veterinary pathobiology at MU‘s College of Veterinary Medicine (CVM). MU CVM’s Catherine Vogelweid and BCFPD Staff Chief Doug Westhoff co-teaching a lecture about successful rescue equipment and its use around large animals. Vogelweid, DVM, PhD, MS, has devoted years of her life and an abundance of experience and expertise to these scenarios. She helped found the Boone County Large Animal Rescue Program, a unique partnership of the CVM and the Boone County Fire Protection District (BCFPD). 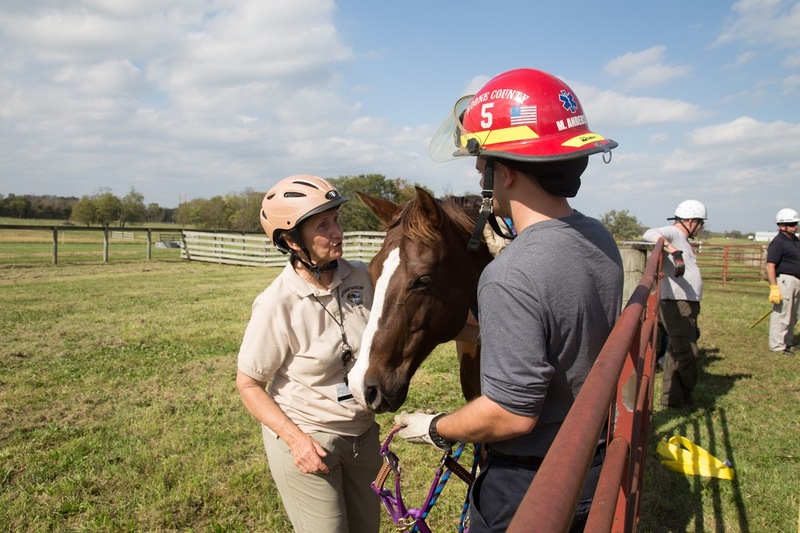 Combining the knowledge and skills of firefighters and veterinarians facilitates safer and faster rescues of trapped animals and helps ensure the health and safety of those animals and the human responders. The program recently conducted its third annual training weekend. 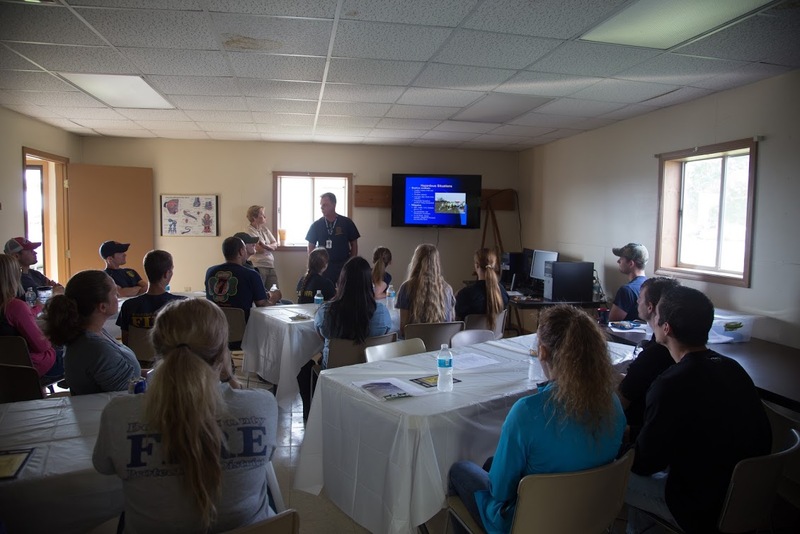 During the weekend, students and faculty from the CVM and firefighters from BCFPD trained together. Veterinarians from the college and BCFPD firefighters can deploy as a single team to rehearse and conduct technical animal rescues. Missouri Task Force One, which is managed by BCFPD, trains at the site as well. The Task Force is one of 28 Urban Search and Rescue teams in the United States. Their response efforts to events ranging from hurricanes and tornadoes, to floods and ice storms, and even 9/11 and a cyclone in American Samoa, have cemented its reputation as one of the nation’s elite disaster response units. Vogelweid’s role in founding the technical rescue program is just a recent installment in a career dedicated to caring for animals affected by emergencies. She is a member of the Missouri Volunteer Veterinary Corps. She deployed to Joplin in the aftermath of the EF5 multiple-vortex tornado that struck the community in 2011, providing veterinary care for dogs and cats in the mass care shelter. Officials said 944 pets were rescued in the days following the disaster, which claimed 161 lives, injured approximately 1,200 people, and destroyed more than 20 percent of the community. Earlier this year, the Missouri Veterinary Medical Association honored Vogelweid with the Dr. William A. Wolff Volunteerism Award. Vogelweid teaches a firefighter how to halter a horse during an exercise for firefighters about approaching and catching loose horses. Vogelweid emphasizes that every family needs a plan in case of a disaster. Having a pre-determined plan can help individuals remain calm and think clearly. A plan and emergency kits need to include care for pets, large animals and livestock in a variety of situations, from a house fire to the earthquake of the century. “The best solution is for individual people to take responsibility and prepare themselves,” Vogelweid says. “Be prepared and know what your local resources are. Those are the very best things you can do, because if you’re waiting for the state to come save you, if you’re waiting for FEMA to come help, you’re on a very long waiting list. “Everybody has to have a plan to save themselves and their stuff,” she continues. “Everybody has to be self-reliant, as individuals and as a university community, in every research lab down to each principal investigator. “For example, here in Connaway Hall, we could have a ride-out team. They would be the faculty and staff members who will get the proper clearances, who will do whatever they have to do to become certified as first responders so they can get access to Connaway following a disaster,” Vogelweid explains. “They will be the ones who will say, ‘Okay, here’s where we can get dry ice so we can load the freezers so the research samples don’t thaw,’ and they’ll save all of the critical specimens in those freezers. The idea is that you create and train a local response team that can save the research animals, essential equipment and samples, and the research data. “From what I see, the best solution is so simple, and it costs so little,” Vogelweid says. “I have disaster kits in my basement for my two dogs. We are stocked and ready to go. If I have to be out of my house in 15 minutes, I can take everything I need for my dogs and go and, honestly, it didn’t cost much to put that stuff together. 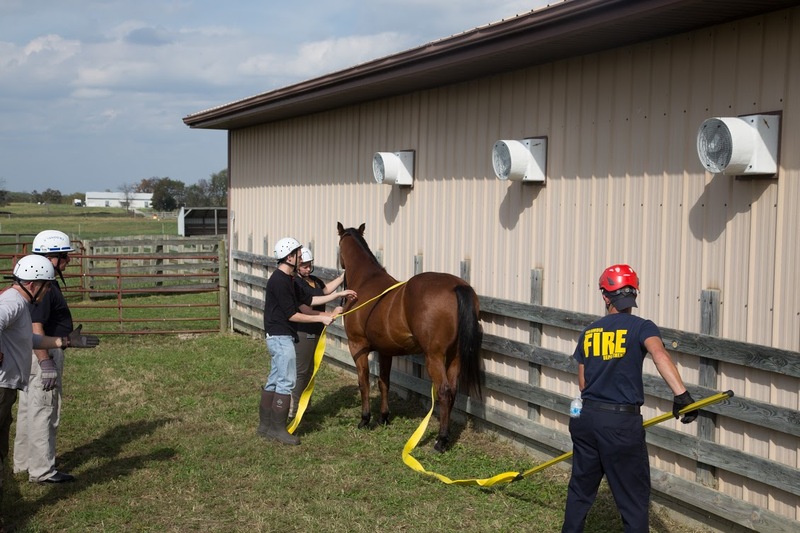 Instructors Keith Branson, DVM, and Battalion Chief Chuck Leake (on left) supervise the placement of rescue straps around a horse by using a pike pole to manipulate the strap from a safe working distance. VM-2 students Lyndsy Gieche and Jordan Rice (center) are assisting the firefighter with strap placement. Sometimes, planning and preparation can be the difference between life and death. Sometimes, it will not make a difference. “Look, it’s always going to be bad for the people who get hit really hard; there will always be an ‘Incredibly Terrible Impact Area’ where everything is gone,” Vogelweid says. “People in this area may have planned and prepared, but they still got taken out. There will be lives lost, and survivors will endure severe losses and hardships. Vogelweid says you will have done a lot to help yourself simply by having water, two to three days of food, a weather radio, and auxiliary charging capability for your cell phone. Since Sept. 11, 2001, the U.S. government has taken steps to encourage all citizens to make their own survival preparations. The tragedies of September 11 highlighted to the nation the importance of being prepared, and the month marks the peak of the Atlantic hurricane season, so the U.S. has observed National Preparedness Month every September since 2004. The Federal Emergency Management Agency (FEMA) has found that a significant number of pet owners will not evacuate a life-threatening situation without their beloved animals. Yet, shelters will require your pets to be current on vaccinations. Clearly, it is important — perhaps, vitally important — to maintain an annual schedule of veterinary visits.